The term "complications" is used in watches and clocks to describe things a time piece does other than just tell time. For example, an alarm is a complication. A stop watch (chronograph) is a complication. Probably the most common complication is a date indicator, or calendar complication. Oddly enough, only Swiss-made Hamiltons offered this feature and it was introduced in 1954… maybe earlier if you consider the Hamilton Illinois models. Believe it or not, I've never tackled a calendar watch before. I've probably restored over 400 watches but never a calendar watch… until now. 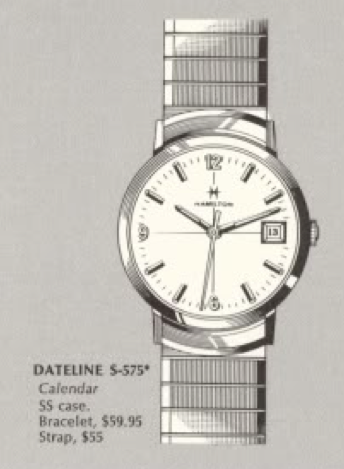 My first calendar watch was a 1966 Dateline S-575. It was produced through 1969. The Dateline S-575 is a manual winding watch. It came in a stainless steel case. Behind the dial is a Hamilton 674 movement - which was made my ETA. It has luminous dots at the hour markers as well as lume on the baton-style hands. I have to admit, I have taken the dial off of a couple of loose calendar movements, just to see what was underneath. I think the term "complication" is a good description for it. When it comes to a calendar model, there are just as many parts on the front of the main plate as there are on the back - or it sure feels that way. Plus, most of them are very small and easily lost - so it's a bit intimidating to take one apart. But - no guts, no glory - so I snagged a Dateline S-575 when I saw one for sale. They don't come up very often. As received it was in pretty nice shape, to be honest. But all used watches need to be serviced before they're put back in circulation. The back of the watch is solid stainless - so this watch opens through the crystal. The stem is a two-piece design with a female portion in the movement and the male portion in the crown. To get the movement out you have to first remove the crystal, then align the stem so the movement can pivot out and once it gets to about 45 degrees it will pop right out (so don't drop it). Here you can see the prong-shaped female portion of the stem sticking out on the below right. From the back it looks like most other ETA sweep second hand movements. The dial-side is another story though. Here, you can see the mechanisms that index the date wheel. First off is the hour wheel in the center of the movement. The hour wheel holds the hour hand. It's driven by the minute wheel to the right. On this watch, the hour wheel also drives the wheel that will move the date wheel. That mechanism is on the left side. Now I've removed the cover plate on the left that covers a spring-loaded index lever. It makes sure the date wheel aligns up squarely in the date window of the dial. You can see the teeth in the date wheel and the index lever centers the gap between the teeth. You can see it next to the upside-down 19. Now the cover of the minute wheel and setting wheel on the right has been removed, along with the wheels underneath it. Now the date wheel can come off. This is where it gets a little tricky. The brass-colored wheel is spring loaded. It has a single tooth that rotates once in 24 hours and the tooth moves the date wheel. Removing springs can be a pain, as they have a tendency to disappear into thin air. The spring is under the wheel so getting the wheel off while not losing the spring is mostly luck - I think. You wouldn't want to try this over carpet - that's for sure. Lastly I'll remove the cannon pinion in the center - that's what the minute hand attaches to. Now the front is effectively clear of parts. Now back to familiar territory - the parts on the back come off just like any other mechanical watch. In this shot I've already removed the mainspring arbor screw so I can take the ratchet wheel off. And here are all the parts, ready to go into the cleaner - except the date wheel that is. I'll leave that alone. All the parts get cleaned, dried and then reassembled with proper lubricants in the all the right places. The now running movement goes onto the timer. Since this watch has a moveable hairspring stud, I can adjust the beat error as easily as the beat rate so I was able to dial it in really nicely. You can see the beat error collapse as the two lines got closer together. Everything then goes back onto the front in the reverse order I took it all off. And best of all, I didn't have any parts left over! Ordinarily the hands just go on at 12:00 so they are aligned with each other. But on this watch I needed to set the time until the date changed - then put the hands on at 12:00 so I knew the date would change at midnight. Then the crystal goes back on. And here's the finished product - with a fresh crystal to complete the restoration. This is a sharp looking watch and since it's my first calendar watch it's earned a special place in my heart and my collection.